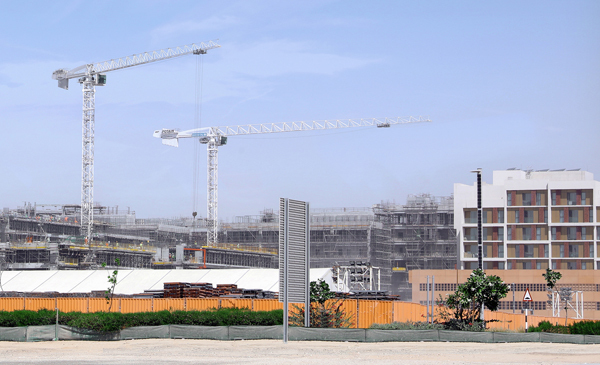 Two new Potain MDT 259 J12 CCS tower cranes are helping construct a 102,000 sqm residential complex in Abu Dhabi, UAE. The Masdar Institute Neighborhood project is being developed by Abu Dhabi Future Energy (Masdar) and Mubadala Development. Contractor Six Construct chose the tower cranes for their high capacity, and they were supplied through NFT, Potain’s Abu Dhabi-based distribution partner. The MDT 259 J12 has a maximum capacity of 12t and a maximum tip capacity of 2.9t. It also features a maximum radius of 65 m and a hook height per base of 71.2 m.
The cranes were installed at the end of January by NFT and will remain on the project until its completion, scheduled for June 2019.